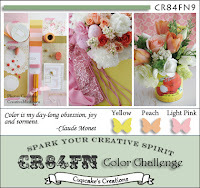 I have some exciting news and today I can finally share with you that I've joined the CR84FN Challenge Team! I'm excited to be working with Mona and the other talented Design Team Members, we'd love to have you play along! I had something different in mind when working with this weeks colors, okay I actually started two different cards, and scrapped them both and went in a totally different direction and ended up with this card. I love the way the BG colors work perfectly with the piece of Basic Grey Curio paper that I used under my stamped image panel. Cool, huh! The background is created by morphing the Smackin' Acetate Technique, as I spritzed my Acetate with some Ranger Perfect Pearls and instead of using Glossy card stock I used Matte. 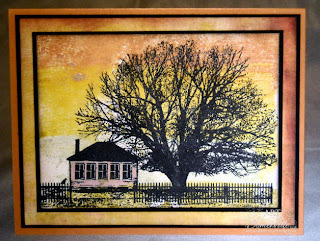 I stamped the beautiful image from The Outpost plate by Artistic Outpost in Black Archival and added the "pink" to my house with marker. 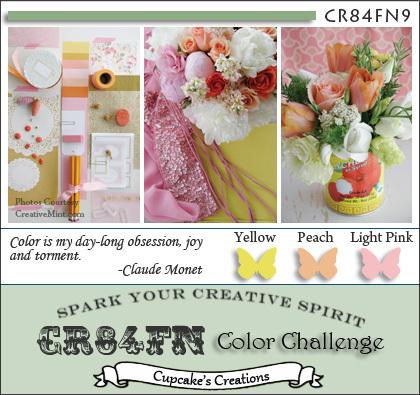 Here's this weeks color challenge, we'd love for you to play along with us at CR84FN, you can find all the details here on how to enter. If you upload to any online gallery please use keyword CR84FN9 so we can find your creations! Okay, Lisa, Now I won't be able to get that song out of my head! But every time I sing it I will think about your STRIKING card! I just LOVE the sunset you created and the description of the technique you used! Just BEAUTIFUL! Lisa - what a fab card. 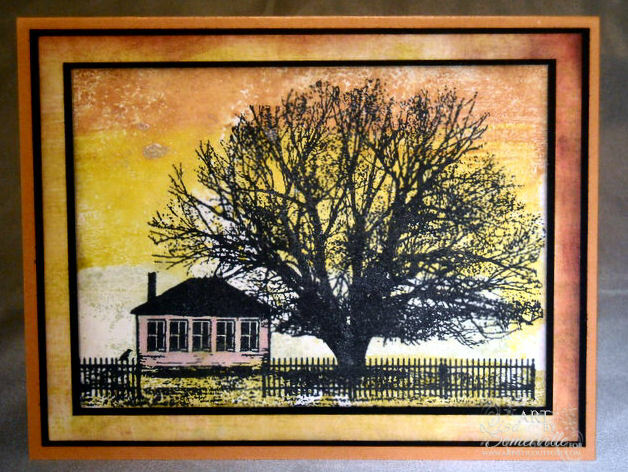 I love that big tree (I have a thing about trees) and the pink house is just lovely! Love that background. Beautiful scene and one of my favorite stamp sets. Beautiful, looks like Springtime! Congrats on your new digs, I don't know how you do it! Love the sillouette image, and the way it just looks like it needs a frame to go on the wall! Fabby colours too. Congrats on your DT post! Congrats for becoming DT with CR84FN. Have a wonderful 2011 ! Wow! Love this wonderful scene and the gorgeous background for it! Just stunning, Lisa! Wonderful project and congrats on the new post. You'll be a great compliment to the team with your style. Beautiful card, Lisa! I love the acetate technique! So stunning! Lisa - this card is an absolute stunner!!! It literally took my breath away! Now that song is stuck in my head but, oh, how I love your little pink house! Great job girl! Congratulations! I love JCM and was so disappointed to see they are getting divorced. He's great in concert! Very pretty card, love the background. This looks AWESOME! I really love the sky. It looks great. Does that tree come with the house stamp? That is one awesome tree. So much life and detail in it. Thanks for sharing! And, have a blessed New Year! Lisa, your card is so stunning! I love the background especially the gorgeous sky! I love this technique! Congratulations on joining this awesome color challenge! beautiful card, Lisa! Love the colors. Gorgeous card, Lisa! What a neat technique! Thanks for the inspiration! Congratulations on your new DT role with Mona, sorry it's taken me so long to get around to leave you a comment! I don't know this song, so I'm going to have to look it up now!